This is the first in a series of posts that give props to blogs that inspire me. Right now, I’m in Turkey on vacation, so instead of scheduling posts of my own cooking that I can’t respond to, I thought I’d show some of the blogs that keep me interested every week. The things I really like in a food blog include great recipe ideas, stylish photos, a sense of the personality of a blogger (I don’t want it to read like an instruction manual!) and a focus on fresh ingredients. I watch a few blogs regularly, but there are a few that stand out as being at the top of the heap. The first I’d like to highlight is called The Naked Beet. This blog meets all of my criteria, and I’m always excited to see the latest posts. The photography is beautiful and enticing, the writing warm and friendly and the recipes are interesting and sophisticated, yet don’t seem to be aimed at seasoned chefs. Here are some recent examples of posts that piqued my interest. 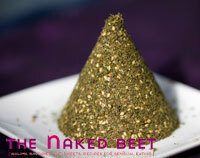 Enjoy The Naked Beet! I’ll highlight another great blog next week! This entry was posted a couple of weeks ago now, but I still haven’t cleared it from my Google Reader. I look at it almost every day. Insanity? Probably. But just LOOK at it! … and then read it. If you are a fan of herbs and spices, as I am, this post will definitely incite some deliciousness. This post talks about Za’atar, a blend of herbs and spices used primarily in the Middle East, but making it’s way into foodies’ cupboards everywhere. There’s some socio-political intrigue involved as well, which makes you think about how important food is to history and culture. Also, do you see the freaking pyramid of spices? Seriously! This post has also been in my saved list for a while… I keep trying to find the right time to make this recipe! This dish is a mix of Mexican flavours (Ancho and Chipotle chiles) and Thai flavours (lemon grass, coconut milk). I knew this would be right up J’s alley, so it’s on my “do it up” list. Soon. I promise. Until then, I’ll just look at the pretty picture and drool.